The New Weird is an odd trend among speculative fiction genres. As it’s often the case with subgenres -fortunately, if you ask me-, it’s almost impossible to come up with a perfect definition that allows the unambiguous classification of a given story. As I understand it, the concept of genre -and please, feel free to add as many subs- as you want- serves little purpose beyond that of allowing to group a set of aesthetic, thematic or formal concerns that may contribute, more or less deliberately, to the interpretation of a particular work in a context populated with several other works that, allegedly, share something with it. I agree with China Miéville when he states about genre that “a label is only a tool, and only as useful as its ability to generate debate and assist understanding”. When dogmatically adhered to, those values linked to the genre labels are damaging to a work in as much a degree as thoughtlessly is the author conforming to them. Nobody receives more help from labels than those in charge of arranging the shelves in the libraries or programming recommendation algorithms for online retailers. That is not to say that the concepts of genre and subgenre are meaningless, but that the unquestioned application of their parameters leads to the stagnation of the imagination and to the riskless conservatism so often observed in mainstream fantastika. These definitions are sort of vague, indeed, but the truth is that when I think back to those few New Weird key novels I have read, like China Miéville’s Perdido Street Station, K.J. 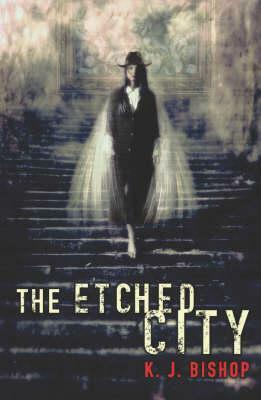 Bishop’s The Etched City or the aforementioned anthology The New Weird, I can’t help to perceive how they share a baroque aesthetic and some values that, in turn, are reflected at different levels, from the excessive nature of their texts to their twisted characters or an effort to distort scenarios and scenes that sometimes gets to oust the plot as key element of the narrative. Self-declared New Weird authors (very active in their defense of the subgenre) share a taste for the grotesque, provocation and a willingness to incite political or social reflection. That may not be new; it may not be weirder that a multitude of previous or contemporary works; it may be an unnecessary label (more so than others? More so than cyberpunk? Space opera? Zombie genre!?) as posturing as arrogant when claiming merits whose invention lays elsewhere. Be that as it may, it is hard to argue that behind the New Weird a real movement exists with a sufficiently grounded tradition as to unite around it a clique of authors with highly fertile imaginations who, challenged by the conventionalism of mainstream fantastika, are producing a body of work which would be a mistake to ignore. 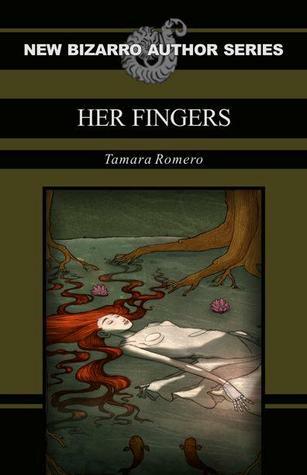 One of the last additions to this group comes from Barcelona, Spain: Tamara Romero and her novel Her Fingers. With its scant sixty pages, Her Fingers endeavors to stretch the constraints imposed by its brevity by densely packing so many good ideas as to pay tribute to the fertility of the imagination of its author. Such richness of imagination is both the main virtue and the main risk of the text, that manages not to drown in shallowness by adopting a non-linear approach to world building, a perfect control of its pace and a touch of social criticism that greatly benefit the novel. In the pages of Her Fingers metaphors abound dealing with gender issues, the disintegration of personality caused by drugs, a denunciation of state control over the individual and a warning of the risks of acritically accepting labels and giving up control over the own life. While its length hinders the ability of the novel of exploring in depth some of the questions it raises, which perhaps are excessive in number given its shortness. Romero, though, is successful in using the weird as an echo chamber that elicits situations that remind us of our world and increase the relevance of the text without the need to go into precise details, such as those adolescents hinted at in the novel that use cybernetic implants as a form of rebellion against their parents, who, in turn, pay for their tattoos in a hollow attempt to quell their wish for transgression. While several passages in Her Fingers can be read as a sort of manifesto of the New Weird or a defense of the love of the strange for its own sake, none of the elements in the narrative is gratuitous; all of them serving a story that tastes like a nightmare and leads to a dazzling awakening. I would love to read a novel by Tamara Romero with more room to leisurely develop her ideas, her premises and her characters. Her Fingers works like a charm because her author manages to turn its brevity to virtue and has the skill to chose wise shortcuts to resolve her ambitious world building. I have no qualms about anything the story shows, but I long for all the things it doesn’t unfold. This book, incidentally, was originally written in Spanish and then translated to English by the author herself. I can’t help attributing some lack of fluidity to that, but it’s a really minor issue and it may rather be in the eye of this beholder than in the text itself. This is a highly recommended novel and I strongly suspect that Her Fingers is not the last that we will hear from her.